Are you looking for the best WordPress comments plugins for your website? Creating an active comment section on your WordPress blog is important to building a strong relationship with your readers and driving traffic to your site. A comment section that’s bustling with conversation will make your blog a place that users want to return to again and again. But it can be difficult to generate valuable comments on your blog. That’s why, in this article, we’re going to share with you the 18 best WordPress comment plugins to help you generate more comments, manage your comments, and grow your blog. Let’s jump in! De:comments is the most powerful WordPress plugin for comments. This premium plugin offers a range of tools to help you increase engagement on your blog. You can totally revamp your comment section and allow your readers to do a variety of things like vote on comments to like and dislike them, use a social login feature and sign in with their existing accounts, share comments on social media, and more. Users can even add images, GIFs, videos, tweets, and more to their comments. One of their stand-out features is their Badge System which rewards and encourages the most active users by adding gamification to the commenting process. All of this helps turn your comment section into a more entertaining place to be. Get Started with De:comments Today! Akismet is one of the most used WordPress comment plugins on the market. This plugin will filter spam comments for you so your website can keep it’s credibility. Instead of wasting time moderating comments from bots and deleting comments containing links to suspicious sites, this plugin does it all for you. You’ll never have to deal with annoying spam comments again – which makes Akismet a must-have for your comment section. You can get Akismet’s Personal plan for free which is great for bloggers and personal websites. But if you’re running a commercial website, you’ll need to upgrade to their Plus plan for $5 per month, per site. Want more information about Akismet? Check out our full Akismet review. 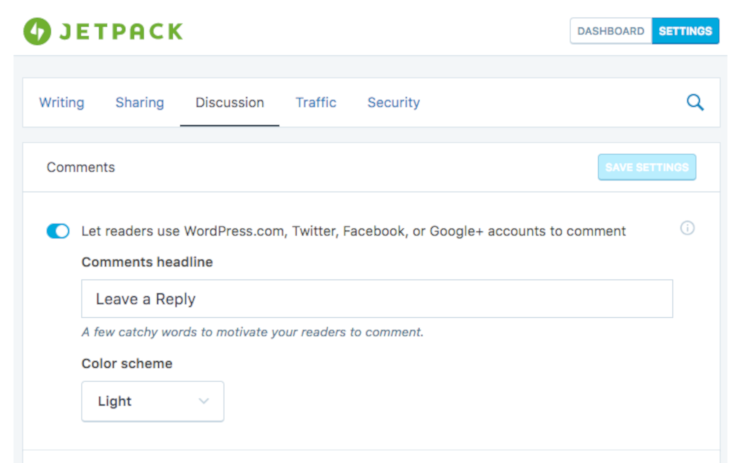 Jetpack Comments is a great WordPress plugin that makes it easier for your readers to comment on your blog. The Jetpack Comments plugin replaces your default comment section with a new comment system that has social media login integration. Instead of having to make an all new account just to comment on your blog, users can sign in with their existing WordPress, Facebook, or Twitter account. Visitors also have the choice of leaving a comment as a guest or using their social networking username. This sleek-looking, easy-to-use comment system is simple to install and you also have the option to customize the color scheme to match your brand. For a more detailed review of Jetpack, check out our complete JetPack review. Get Started with Jetpack Comments Today! Thrive Comments is another option we consider to be one of the best WordPress comments plugins. This powerful plugin collects all of the most addictive elements of social media and community forums and adds them to your WordPress comments. Your visitors get the satisfaction of seeing other users “like” their comments and they get to earn achievement badges by commenting. The plugin also includes features that allow users to feel validated by receiving “up-votes” and getting their comments featured. With Thrive Comments you get extensive reporting on visitor activity over time too. You can see stats about your most active commenters, find out which of your posts are most popular for commenting, and track your engagement progress. Get Started with Thrive Comments Today! The WordPress Comment Rating Plugin is a simple and easy-to-use plugin that allows users to rate the comments in a post. The plugin can also sort comments by most popular. Users will be encouraged to engage more in the comment section when their comments get great ratings and rise to the top of the pack. You can purchase a regular license for the WordPress Comment Rating Plugin for only $22 which comes with future updates and 6 months of support from wpbuddy. Get Started with WordPress Comment Rating Plugin Today! Disqus Comment System is one of the most popular commenting systems for WordPress sites. With the Disqus Comment System you can replace the default WordPress comment section with theirs. Their interactive comment section will help you increase engagement, grow relationships with your visitors, and retain readers. 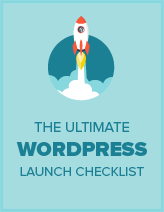 And their 1-click installation seamlessly integrates with WordPress which means you don’t have to know a thing about code. With Disqus you can bring users back to your website with email and browser notifications, users can vote for comments, as well as add fun elements to their comments like photos, videos, mentions, and more. Users also get flexible social login options and you can sort discussions by oldest, newest, and best comments. Get Started with Disqus Comment System Today! While data shows that you should allow comments on your blog, you may occasionally want to disable comments on your WordPress posts. You can easily do it with the Disable Comments plugin. This free plugin allows WordPress administrators to disable comments on any post type like blog posts, pages, and attachments. If you want to disable comments on specific individual posts you can or you can disable comments on your entire WordPress website. Get Started with Disable Comments Today! CommentLuv is another WordPress comments plugin that comes with a variety of features for your comment section to grow traffic to your site and increase engagement. With CommentLuv, users can add their Twitter link to their comments, add keywords, and you can add a top commenter widget. The plugin also fights off spam comments and readers have the opportunity to register for your site to unlock advanced CommentLuv features like dofollow links and more. Get Started with CommentLuv Today! Facebook Plugins, Comments & Dialogs for WordPress is a comment plugin that enables you to integrate many Facebook features with the comment section on your website. They offer 11 different Facebook plugins that can be added to your site with only 1 line of code. Facebook plugins include: Facebook comments, like button, share button, send button, and more. With this comment and social media plugin, the users on your site who also use Facebook will have everything they need to interact with your posts in one place. Get Started with Facebook Plugins, Comments & Dialogs for WordPress Today! WpDevArt Facebook Comments is another great plugin to integrate Facebook with your comment section on WordPress. The WpDevArt Facebook Comments plugin is a tool that allows you to show Facebook comments to visitors on your website. This user-friendly plugin is available for free. You can upgrade to the pro version to get access to features like the ability to choose the color scheme, set the background color, and 39 awesome animation effects. Get Started with WpDevArt Facebook Comments Today! Comment Approved is a simple WordPress plugin that will send out a customizable notification to a user who has left a comment on your website once the comment has been approved by you. This plugin is free to download and it’s a great way to encourage users to return to your site. Get Started with Comment Approved Today! Subscribe to Comments Reloaded is another popular WordPress plugin that gets users to return to your website again and again. This plugin enables users to sign up to receive email notifications any time a user replies or comments on a post that they’ve already commented on. Subscribe to Comments Reloaded also comes with a subscription manager that commenters can use to unsubscribe from certain posts or suspend all notifications when they don’t want to be updated on conversations any longer. You might already be aware of Yoast SEO, one of the most popular SEO plugins. But Yoast has another amazing plugin for comments called Yoast Comment Hacks. Yoast Comment Hacks adds small hacks to the default WordPress comment section to make it easier to manage. For instance, it adds cleaner comment notification emails. It also adds a button in the WordPress toolbar to email all of the commenters on your post at once. Another awesome feature is the ability to redirect first-time commenters to a thank you page that encourages them to sign up for your email list. The Simple Comment Editing plugin for WordPress is a tool that lets anonymous users edit and/or delete their comments for up to 5 minutes. Users can spend more time leaving you a thoughtful comment with the ability to edit and delete. All you have to do is install the plugin and the rest is done for you. Get Started with Simple Comment Editing Today! No Page Comment is a great WordPress plugin that gives you complete control over your comment section. This plugin lets you choose whether comments are enabled or disabled by default on all new posts, pages, and custom post types. At the same time, you also have the ability to individually enable comments on posts or pages. You can also quickly disable all comments for a specific post type. Get Started with No Page Comment Today! The wpDiscuz plugin for WordPress is another plugin that’s loaded with features to make your comment section more enjoyable for your readers. With wpDiscuz you can add an interactive comment box to posts and other content types. You also get access to notifier buttons that give you live updates of new comments. Other features include full integration with social network login plugins, a “Load More Comments” button, and more. This powerful WordPress comments plugin also claims to bring the fastest commenting experience due to it’s boosted core. Get Started with Comments – wpDiscuz Today! Replyable by Postmatic is a WordPress plugin that takes comment subscription to another level. Users can sign up to get email notifications anytime someone comments on your blog posts. But with Replyable’s machine-learning, no one will get annoyed by receiving too many emails. Replyable rates comments for relevance and only sends the best to subscribers. If users want to reply to a comment all they have to do is reply to the email. The plugin is free to download but if you want premium features like the ability to reply to comments right from your inbox, it costs $2.99 per month. Get Started with Replyable Today! Voice Comments & Reviews by Heyoya is an awesome WordPress plugin that lets users leave voice comments on your posts. This fun and unique way to interact is a great way to keep users entertained and on your site for longer. You can install it by copying and pasting only 1 line of code and you can use the plugin in over 20 different languages. It also comes with Heyoya Mobile so you can record and track voice comments on the go. With voice commenting you can have more personal conversations with your readers and provide an experience they won’t get on other sites. Get Started with Voice Comments & Reviews – Heyoya Today! We hope you enjoyed this article on the 18 best WordPress comments plugins. Now you have a bunch of great tools to increase the activity in your comment section and manage all the new comments you’ll receive. If you liked this post, check out our article on 30 ways to make money online. Which is the best do you think for SEO Disqus or No comment? Personally, I don’t like Disqus, because sometimes it takes to load all the published comments. I’d go for De:Comments or Jetpack Comments. Glad you find it helpful, Shane! Hey, i appreciate your post. This is very informative. I love it. Thanks!!! Excellent article. All the above mentioned list of plugins are very handy for SEO. Thanks for sharing such stuff here with us. This will help out many people whoever read this blog post. You have provided a great list of tools to increase the activity in the comment section. I like this post and I think they are definitely going to help me in the future.